Enjoy an entertaining afternoon with delicious pre-dinner nibbles provided. 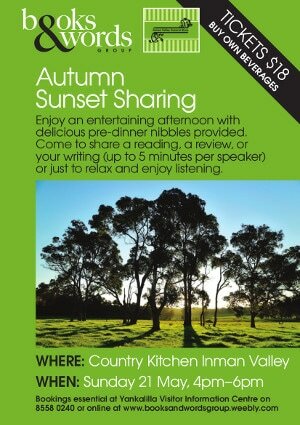 Come to share a reading, a review, or your writing (up to 5 minutes per speaker) or just to relax and enjoy listening. Pre-dinner nibbles included. Purchase your own beverages.